Recommended Name: � the Tarocco Siciliano, later form. This pattern was originally classified as IPT-2.1. A new type of design seems to have replaced IPT-2 in Sicily in the 19th century, probably about 1830, and, with minor changes, is that used to this day (1978). 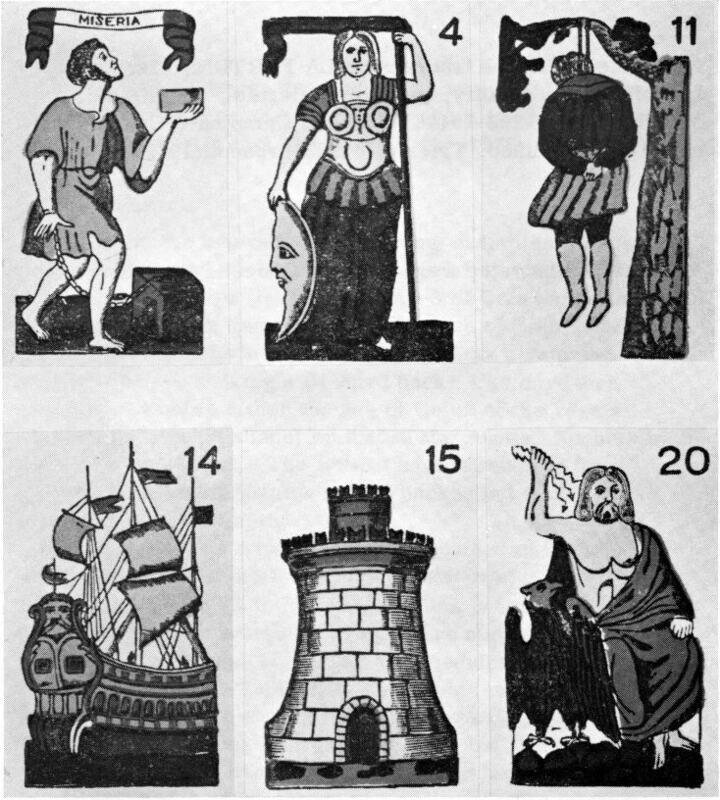 Though in the two earliest surviving examples the 4 of Coins is missing, the pack almost certainly originally had 63 cards like IPT-2 (lacking the ace-3 of Coins and the ace-4 of the other three suits). The ace of Coins was added, presumably in 1862, to bear the tax stamp and maker's name, making a 64-card pack: this card was made to resemble either the ace of Coins of the regular Sicilian pattern (Modiano) or that of the regular Neapolitan pattern (Campione). 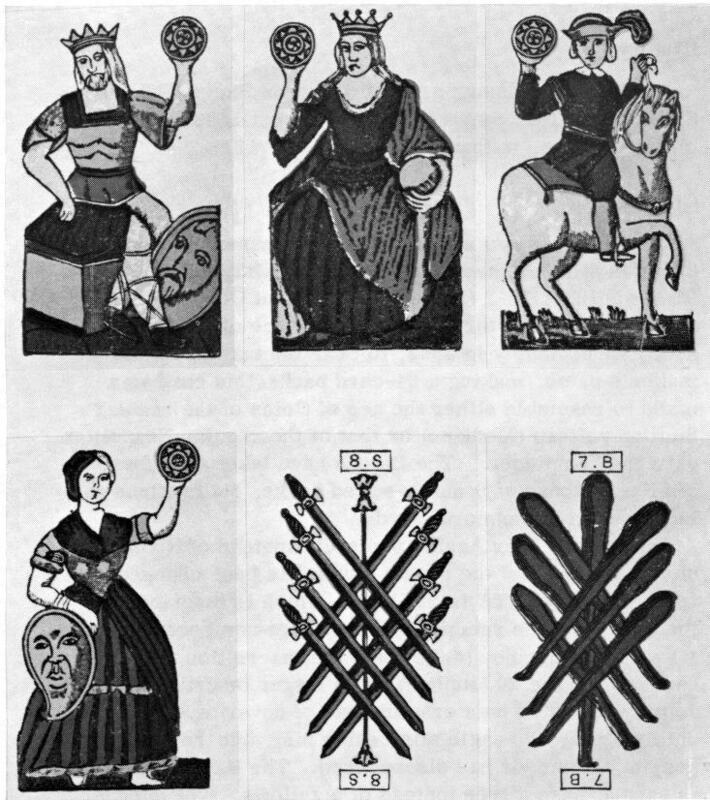 The Batons have taken on a form similar to those of Spanish-suited packs, but continue to intersect on the numeral cards. The trumps bear Arabic numerals instead of Roman ones; the name of the lowest trump has been changed from LA POVERTA to MISERIA, which is inscribed on the card, and the remaining trumps are numbered from l to 20. Constancy (4) has lost the inscription on her banner, and the 20 (Jupiter) is no longer inscribed GIOVE. Jupiter is seated on a crag instead of hovering over a city on his eagle; the eagle sits beside him, but the accompanying Ganymede has disappeared. The Hanged Man (11) is hanged from a tree instead of a gallows. The queens and 10s now bear indices. In the earliest examples, a moustached king replaces the Empress on trump 2, but this change was later reversed. The pack has only a single-figure form. A maker using the trade-name LA FORTUNA, 1st half of the 19th century, probably Palermo. Cards from a pack by Concetta Campione of Catania.